Some countries of Eastern Europe, e.g. 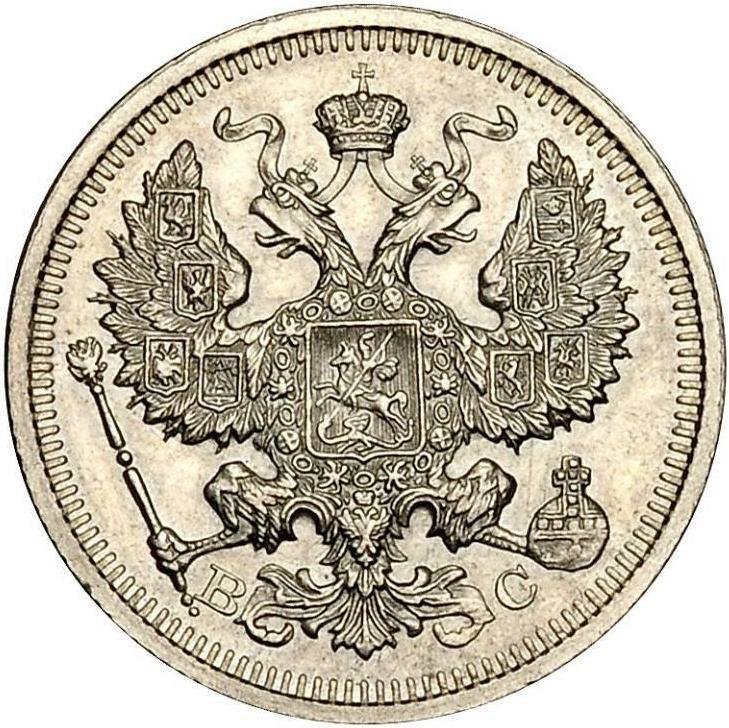 Russia, Serbia, Montenegro, seem to be fondest of double-headed eagles on coins - or at least on their flags, if, like Montenegro, they don't issue their own coins. I always thought that the double-headed eagle was a monarchical symbol only, but apparently not. It has however been used by monarchs, such as Alexander I of Yugoslavia. These are marvellous Yugoslavian examples of that beast. What is interesting is that the 1931 coins use the Roman alphabet, whereas those of 1932 use the Cyrillic. Here's a hybrid double-headed eagle, sharing its space with the fasces. It was issued by Italian-occupied Albania. 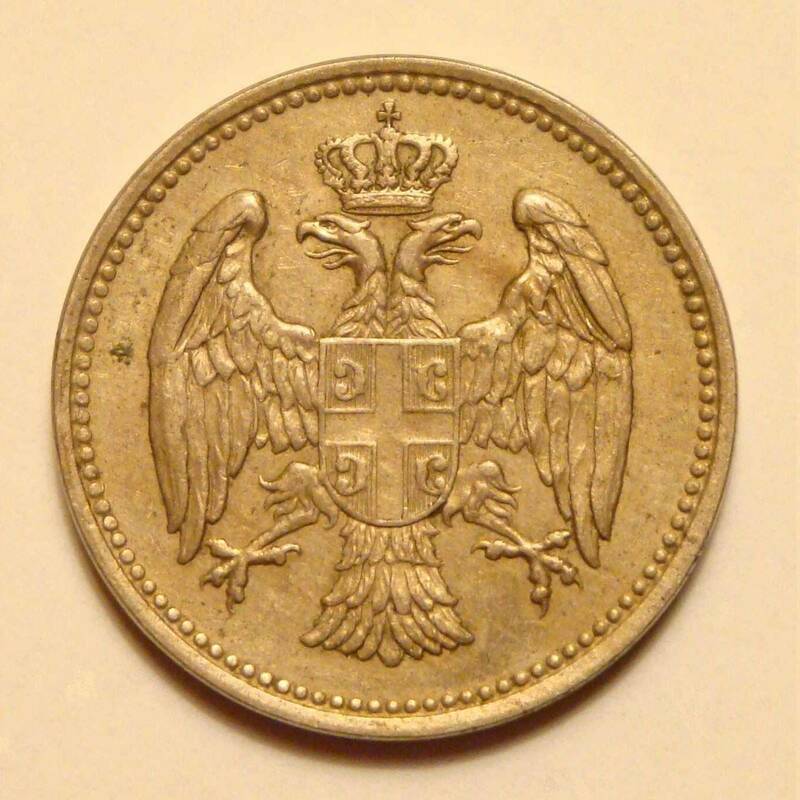 After the war, the communists of Albania retained the double-headed eagle on some of their coins, rather surprisingly. Here's a more modern Russian eagle from 1998. A splendid older Russian beast from 1850. It seems the eagles were different in different reigns. This is a 1917 20 kopecks. This is a 20 para of 1883 from Serbia: a beautiful photo, taken by our forum member Zantetsuken. 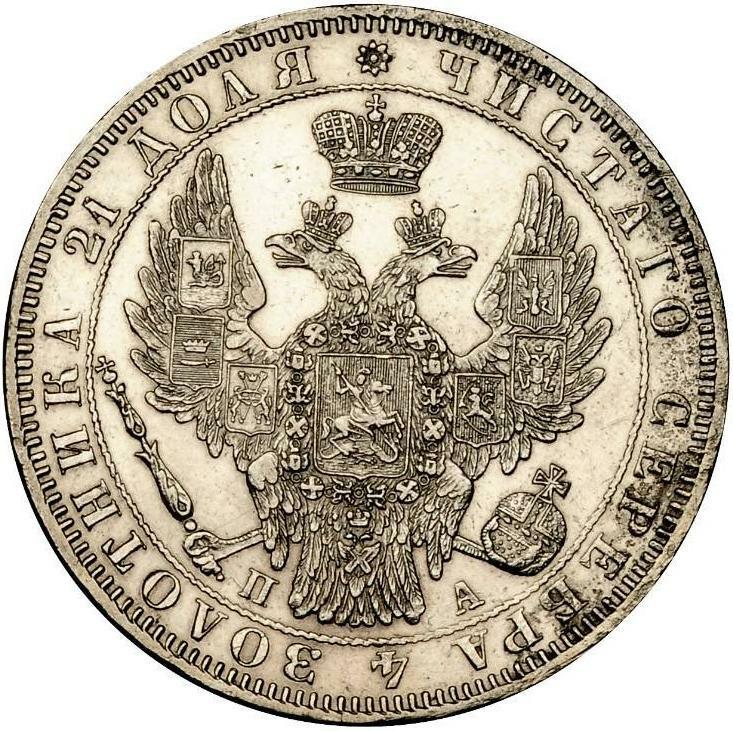 The Serbian double-headed eagle survived on the nasty zinc coins of the Nazi occupation, which I won't illustrate. 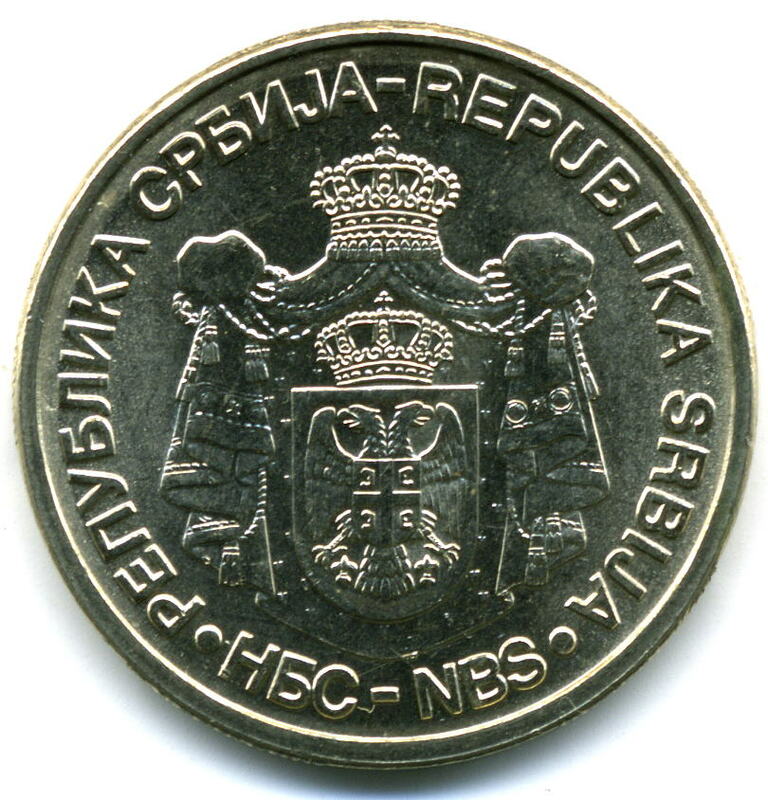 On the modern Serbian coins the eagle remains hidden away in the coat of arms. Austria-Hungary had a variety of eagles too. This is a ¼ florin from 1858, followed by a one Thaler coin of 1868. 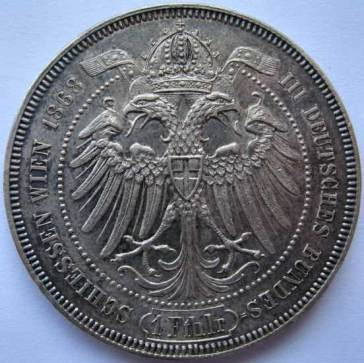 As recently as 1937, modern Austria had a double-headed eagle on a two schilling coin. After World War 2, the eagle only had one head (see 10 schilling, 1986). Did the Allies chop one head off as a punishment, I wonder? In any case, I always thought that one of the heads referred to Hungary, which was no longer relevant to Austrian coins after World War 1. 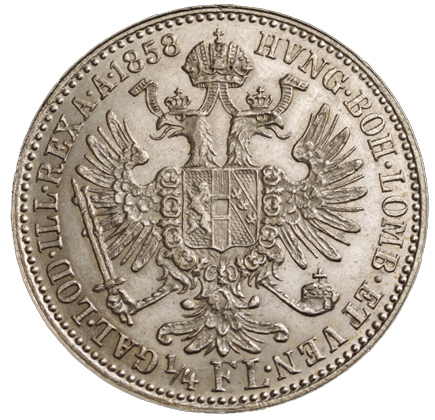 As recently as 1937, modern Austria had a double-headed eagle on a two schilling coin. 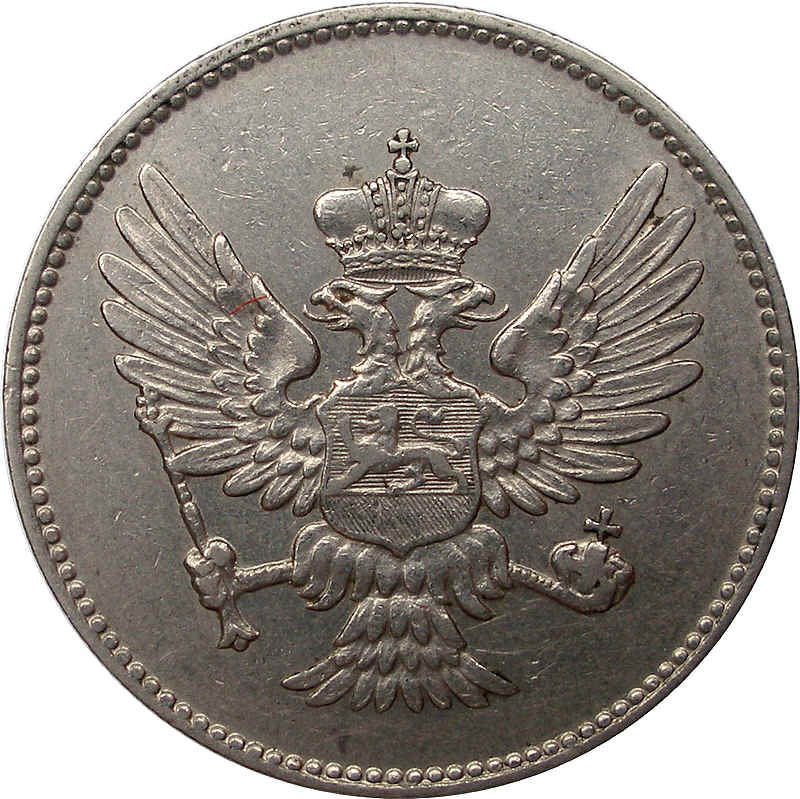 After World War 2, the eagle only had one head (see 10 schilling, 1991). Did the Allies chop one head off as a punishment, I wonder? Not sure whether the two-headed eagle has always implied a "duality". Initially it simply meant a higher rank or status ("if an eagle means power, two eagles mean more power"), I think. Later it usually referred to various dual systems - king and emperor, east and west, etc. The eagle of the Holy Roman Empire had one head first, and later two. Austria used the double-headed eagle until the end of the monarchy in 1918. Then a one-headed eagle (with a mural crown, a hammer and a sickle) was introduced as the symbol of the (First) Republic. The authoritarian regime ("Austrofascism") between 1934 and 1938 used the double-headed eagle again - without a crown, but each head had a halo. Between 1938 and 1945 Austria was part of the German Empire and used that eagle. After WW2, Austria went back to the eagle of the First Republic; the only element added was the broken chain. That represents the new freedom of the country. Though the Soviets remained in their occupation zone of Austria until 1955, I believe. Not sure whether the two-headed eagle has always implied a "duality". Initially it simply meant a higher rank or status ("if an eagle means power, two eagles mean more power"), I think. Later it usually referred to various dual systems - king and emperor, east and west, etc. The difference between a king and emperor isn't always clear to me. I used to think that he was a king of kings, but that isn't always the case. Some kings have ended up calling themselves emperor when they ruled over their own country only and nobody else's.